Are you wondering how to make oat flour? I’m a fan of making things myself. Especially things that are super easy. Usually it’s significantly cheaper to DIY and a lot of the time it’s better for you too. 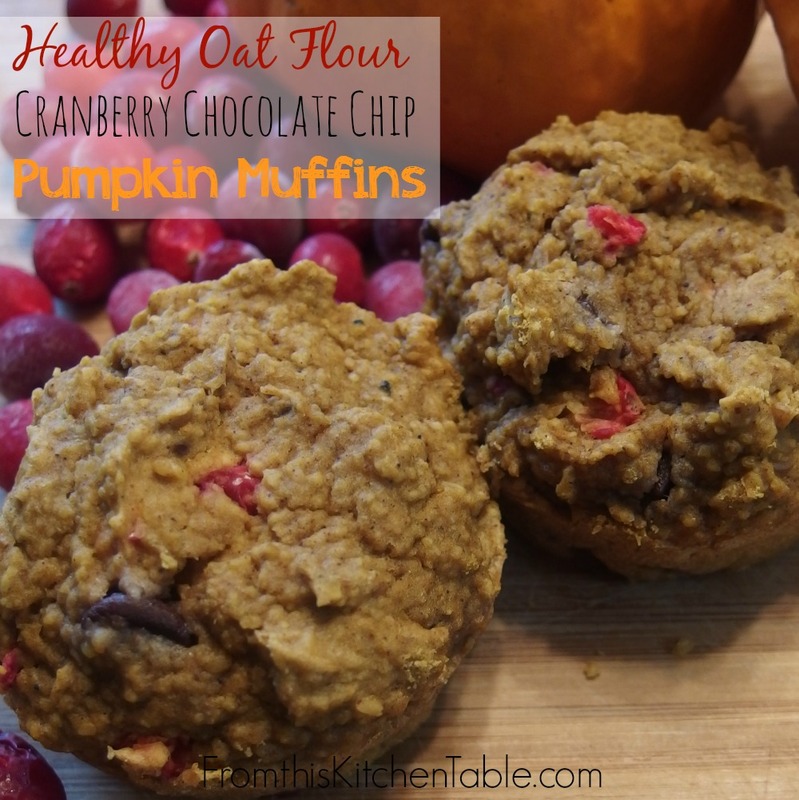 Oat flour is one of those things. Don’t spend extra money paying someone else to grind your oats! Do it yourself. It takes seconds. Nope, that’s not exaggerating. It really is as easy at it seems. Let’s talk blenders for a second. I received a JC Penney brand blender when we got married 12 years ago. Nothing super expensive or fancy but it worked. Until it didn’t. It burned out after a couple of years. Next, we got a Ninja Prep. Again, nothing super expensive. I think we got it on Black Friday for under $40. That worked okay for a while. Then it spend a year of making me wonder if each use was going to be its last until it finally hit the dust a year ago. The homemade oat flour comes out so much finer than it ever did in the Ninja. 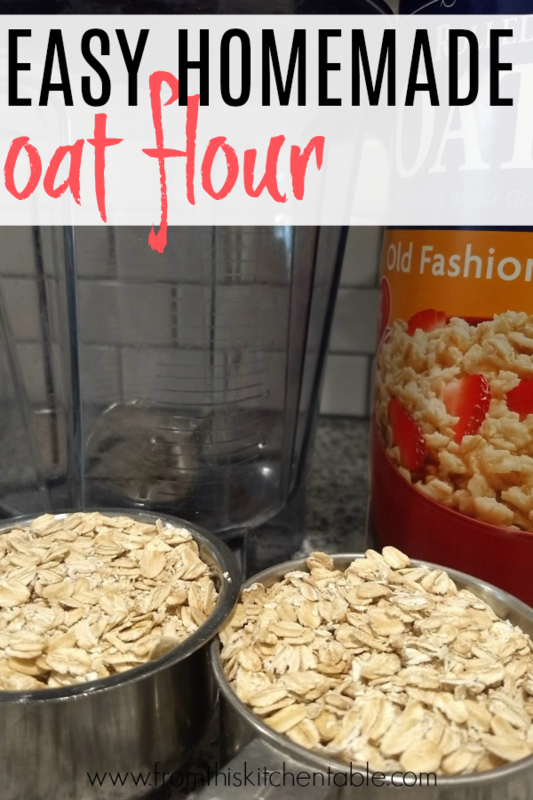 It’s as easy as measuring your rolled oats, putting them in the blender, and turning it on. 30 seconds. That’s it – and you are done and ready to bake. If the recipes calls for 1 cup of oat flour, put 1 scant cup of rolled oats in the blender. 2 cups of rolled oats equals about 2 1/3 cups of homemade oat flour! Be sure to “fluff” your flour when it comes out of the blender before measure. It can be a little compact. 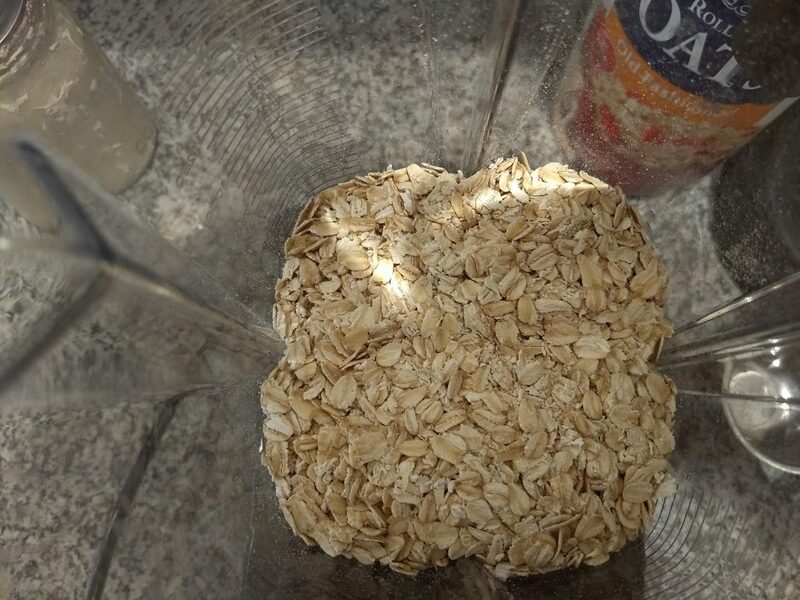 Put the amount of rolled oats in the blender that you want of oat flour. Turn the blender on and blend for a minute - the oats will turn into a flour like powder. 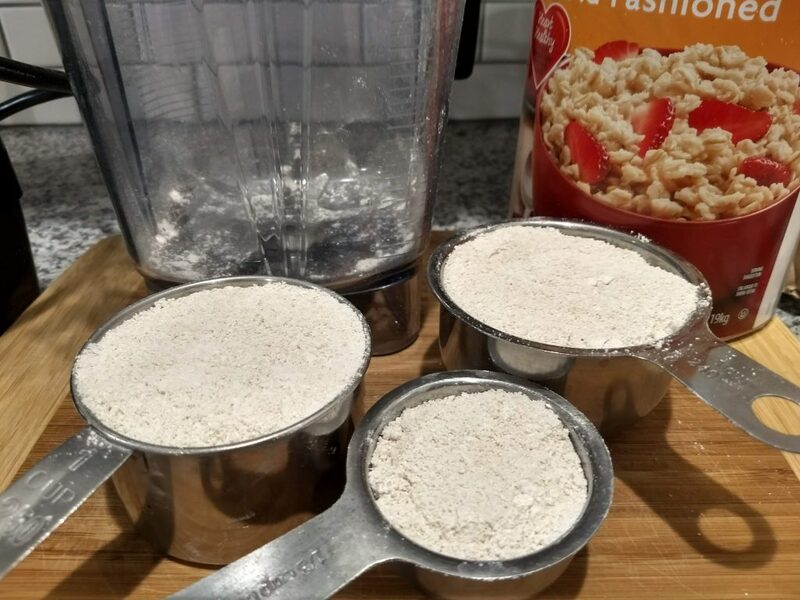 Loosely scoop into a measuring cup and use in place of purchased oat flour. What are you favorite food items to DIY? Give this easy homemade oat flour a try before you go out and buy it again. 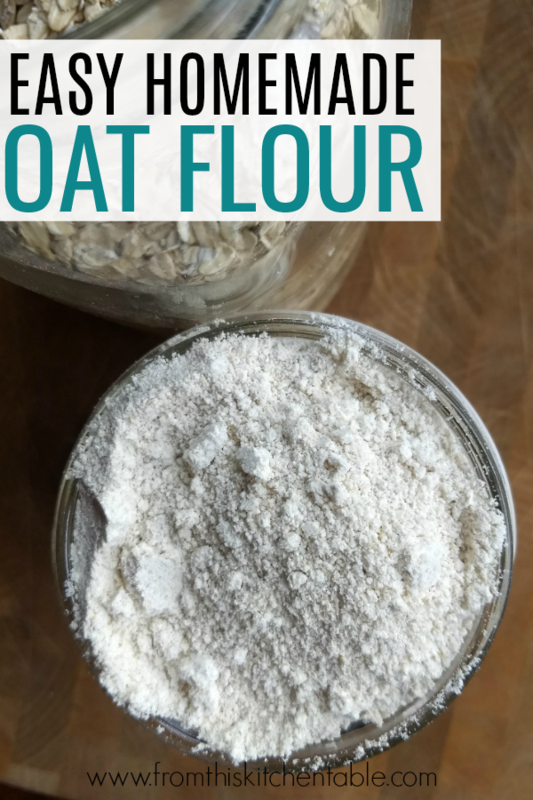 Learning how to make oat flour is a breeze! This entry was posted in Food, Recipes on October 13, 2018 by Deanna Michaels. 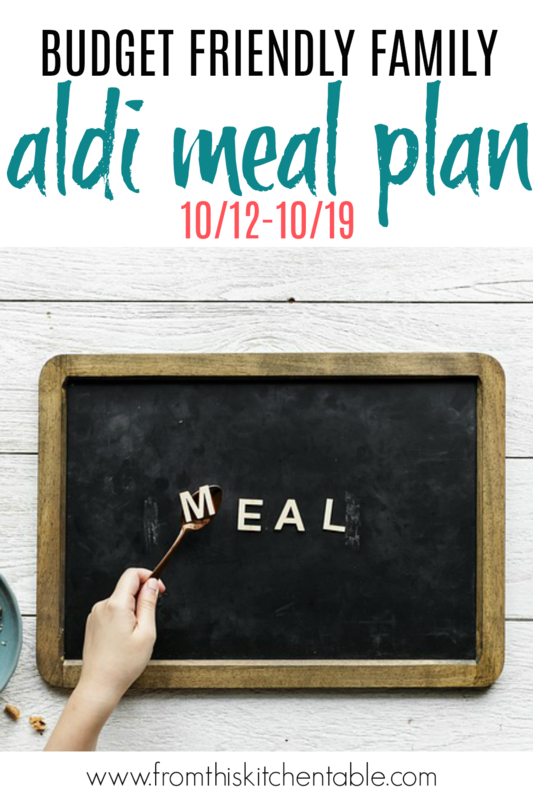 We are back again with another meal plan that uses the produce and meat sales in this week’s Aldi ad. I love shopping at Aldi – the bulk of my purchases come from there and then a will pick up a few items that are on sale at other stores. So an Aldi meal plan is the best! If you struggle with coming up with ideas for what to eat this week, I hope this post gives you some inspiration. 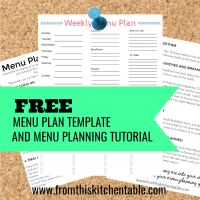 Save hundreds by lowering your grocery bill and make your life easier using this menu plan template! Free in our resource library when you sign up for our weekly newsletter! This week, I’m not only going to include the sample Aldi menu, but I will also share what I’m feeding my family for the next week on my $170 a month grocery budget. This means twice as many ideas. These prices are in my local ad – your prices might vary. This entry was posted in Food, Menu Pans on October 12, 2018 by Deanna Michaels. Fresh cranberries are so tart and delicious. 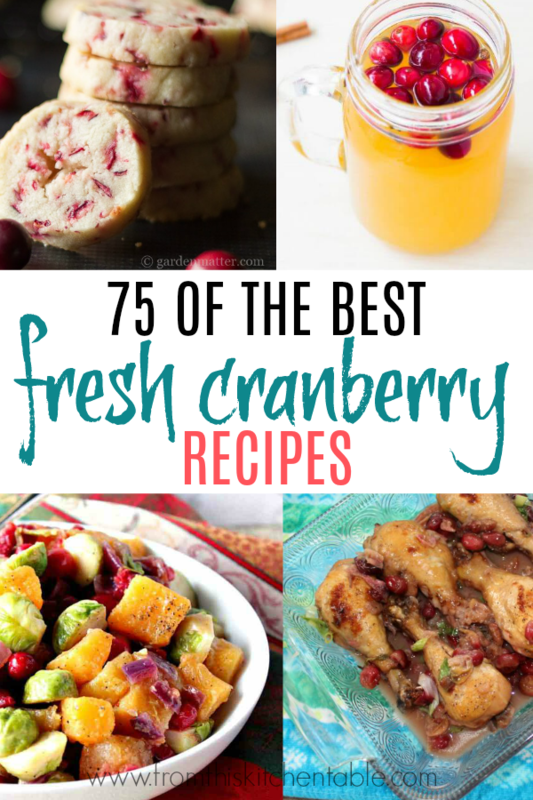 That means that fresh cranberry recipes are the best. Obviously there is a place for dried cranberries, but man, fresh is just unbeatable. Frozen cranberries are a perfect substitute for fresh, so when you find a great deal on cranberries after Thanksgiving (I’ve gotten bags for 49 cents before) stock up on enough to last you the year and just store them in the freezer. 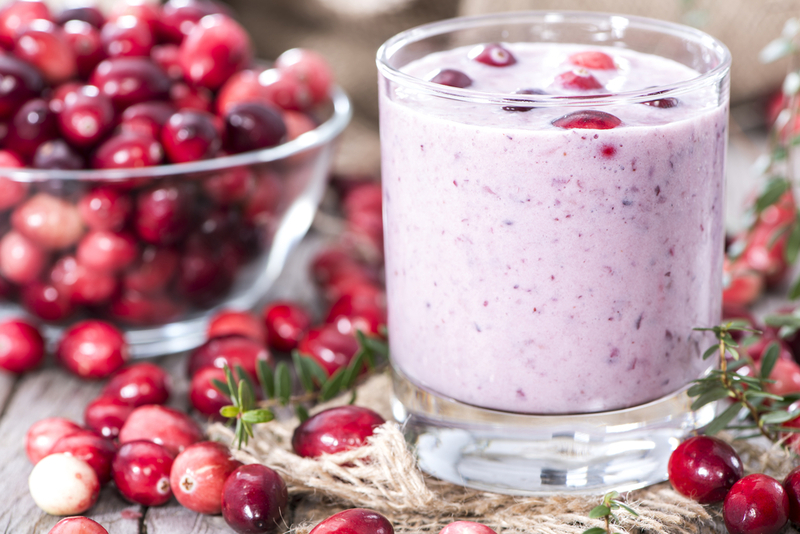 Maybe you find yourself wondering what exactly you should do with fresh cranberries. 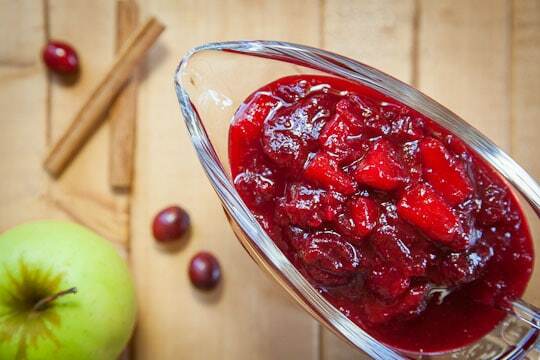 Perhaps the only way you’ve ever seen them used is in cranberry sauce that’s set out with the turkey (even though almost no one eats it). 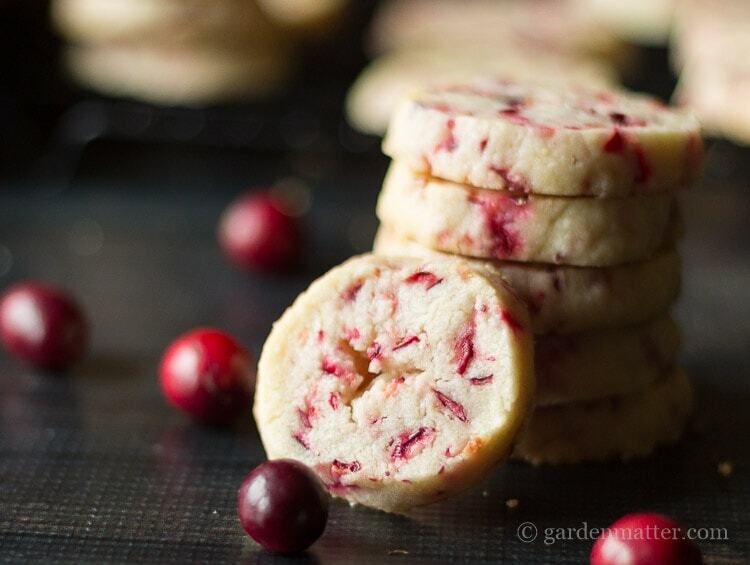 This post is the ultimate list of fresh cranberry recipes. You can experiment and cook and bake to your heart’s content. There are things from muffins to appetizers to chicken to desserts. Everything you could possibly want or need. 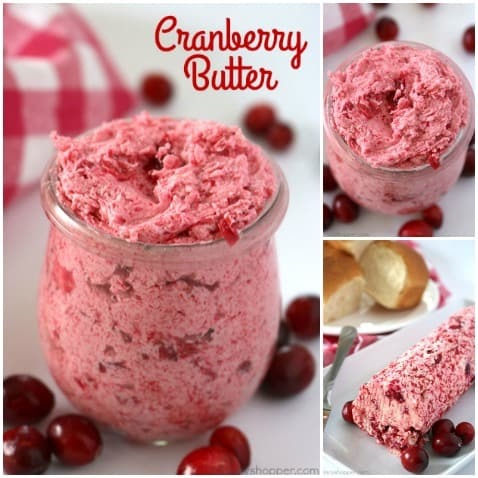 Do you enjoy cranberry season as much as I do? 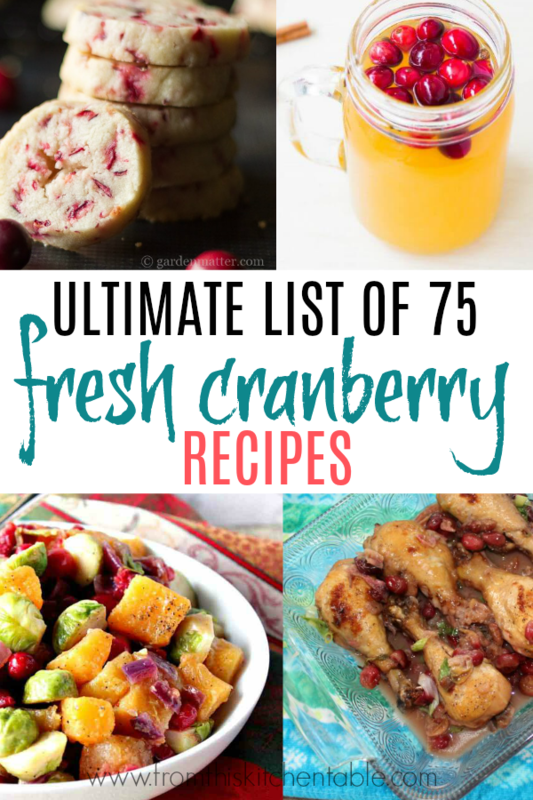 What are your favorite fresh cranberry recipes? 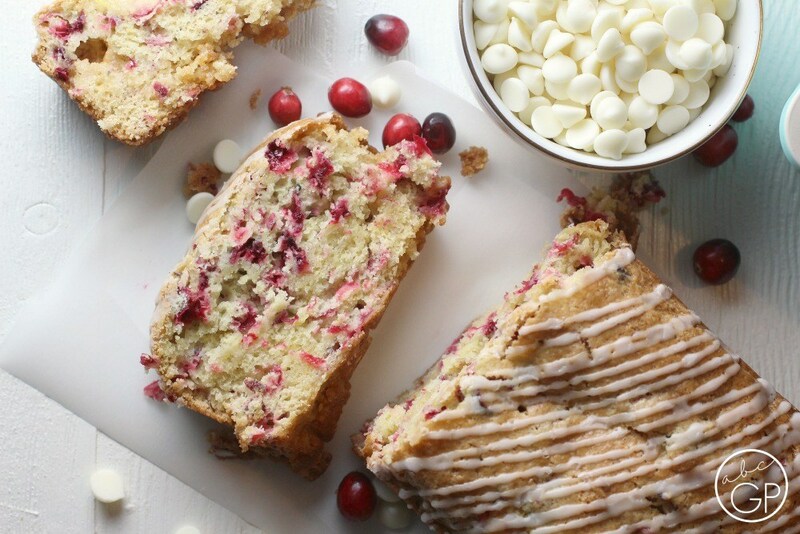 Baking with cranberries is on my list to do as soon as possible. 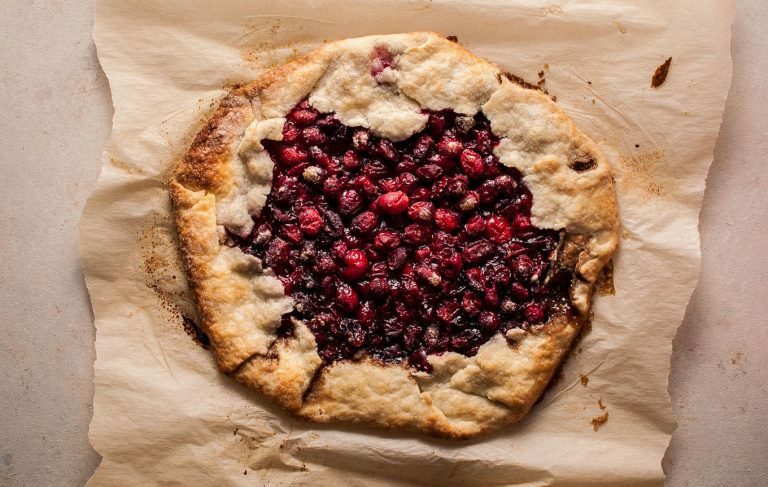 Both the tart sweet and tart savory combinations are perfection. This entry was posted in Food on October 10, 2018 by Deanna Michaels. Do you struggle with coming up with meals to make each week? This Aldi meal plan will give you the inspiration you need to come up with a weekly meal plan for your family. 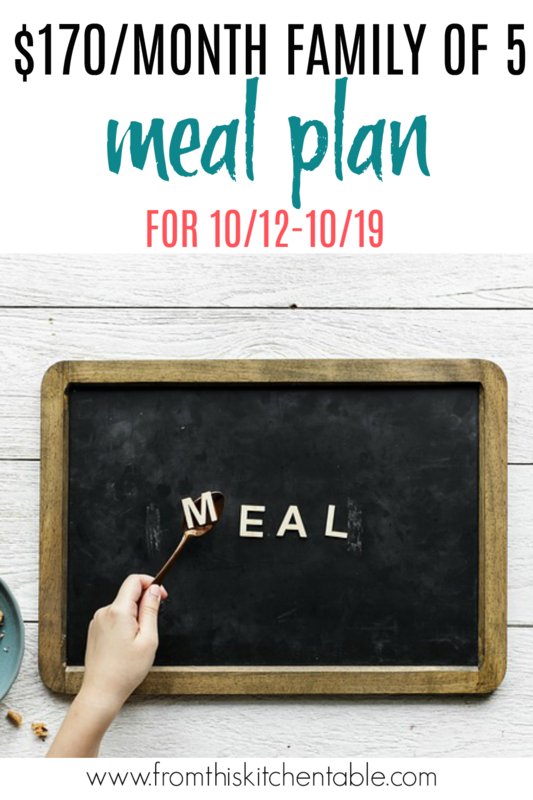 You can use this meal plan for your week as written or choose just some of the recipes from it to combine them with your family favorites or a recipe you’ve been meaning to try for months. Spaghetti (with ground beef or meatless). Serve with raw vegetables and french bread. What are you going to make this week? Do you use an Aldi meal plan? Basing your menu off of what’s on sale (or what you picked up on clearance or sale the weeks before and put in the freezer) is a great way to stretch your dollar and feed your family on a budget. This entry was posted in Food, Menu Pans on October 5, 2018 by Deanna Michaels. 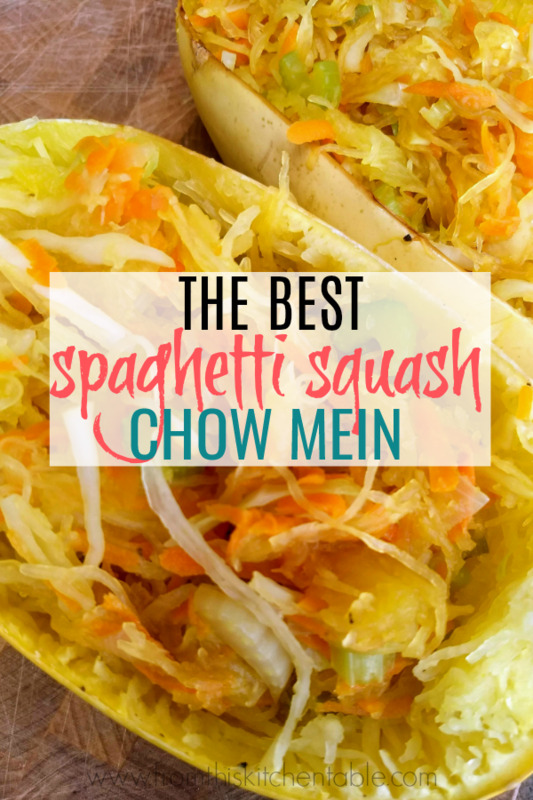 If you haven’t jumped on the spaghetti squash train yet, this is the recipe to do it on! 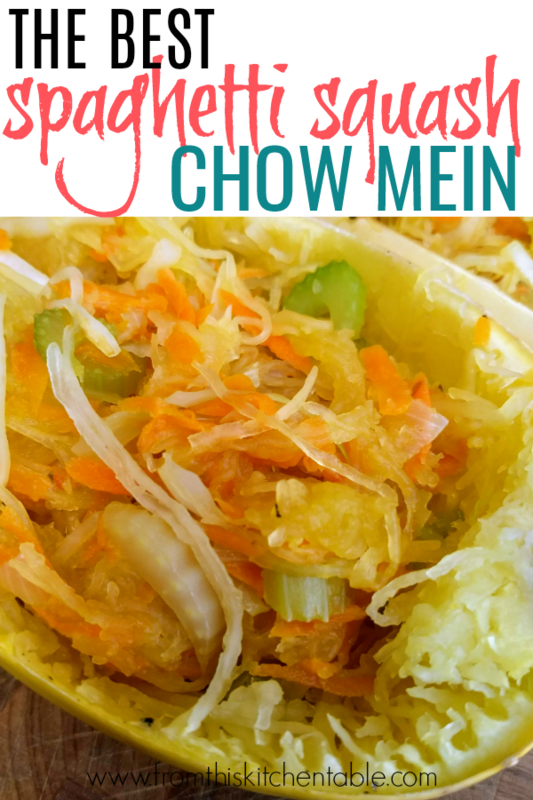 Spaghetti Squash Chow Mein is so good. I’ve had some spaghetti squash flops over the years, but this recipe is not one of them. In fact, I eagerly await squash season so I can make it again each year. My girls (2 and 7) eat seconds of this and even my (not a fan of squash) husband gives this a thumbs up. I suppose it doesn’t hurt that one of his favorite meals is the regular kind of chow mein. This dish is loaded with veggies. If you want it to be vegetarian, leave off the chicken. For the omnivores out there, the chicken adds a tasty touch. A lot of spaghetti squash recipes don’t hold up well as leftovers, but we enjoy this one the next day just as well. I’m all about cooking once and eating at least twice! This recipe, as written, fed my family of 5 twice, so I’d say it would serve 6-8 as adult portions. I bought 3 spaghetti squashes that totaled 6 pounds. 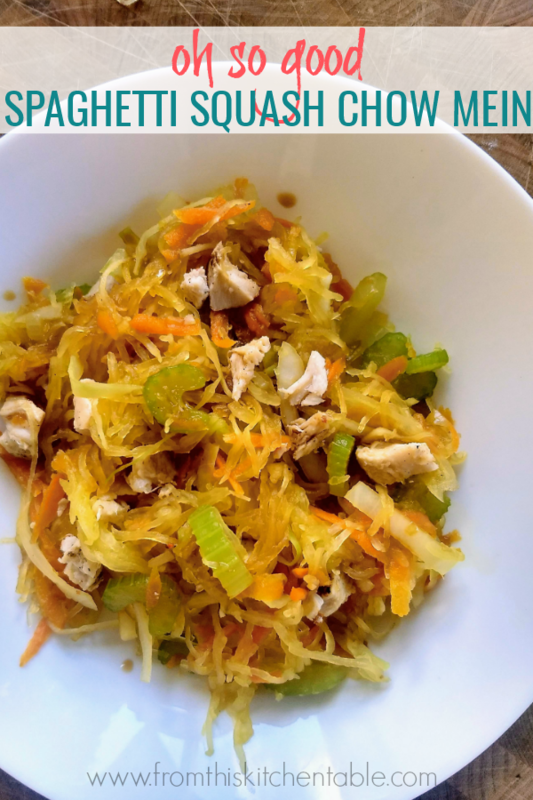 The method of cooking spaghetti squash that’s in this recipe is my go to. It always turns out fabulous and once I cut the squash in half, it’s super simple. Another of my favorite spaghetti squash recipes is this one: Tex Mex Spaghetti Squash! Yum! Cut spaghetti squash in half and scrape out the seeds and stringy insides. Drizzle lightly with olive oil and sprinkle with salt and pepper. Place cut side down on a baking sheet and bake at 350 degrees for 45 minutes. Remove from oven and let cool until you can handle them. Use a fork to scrape across the squash short ways to make "noodles". In a large skillet heat a tablespoon of oil and saute the onions 3-5 minutes. Add the garlic and ginger and continue to cook a few more minutes. Add the carrots and celery to the skillet. Stir and cook a few minutes. Add the cabbage and cook until all the vegetables are tender. Add the spaghetti squash to the skillet and combine. Drizzle ¼ cup of soy sauce (or alternative) over the mixture. Season with salt and pepper and additional soy sauce to taste. I’m curious, where do you stand on spaghetti squash: lover, hater, or never tried? If you are a fan, what’s your favorite way to eat it? This entry was posted in Food, Main Dish, Recipes on October 3, 2018 by Deanna Michaels. Mmmmm. Light, airy, hot off the griddle. 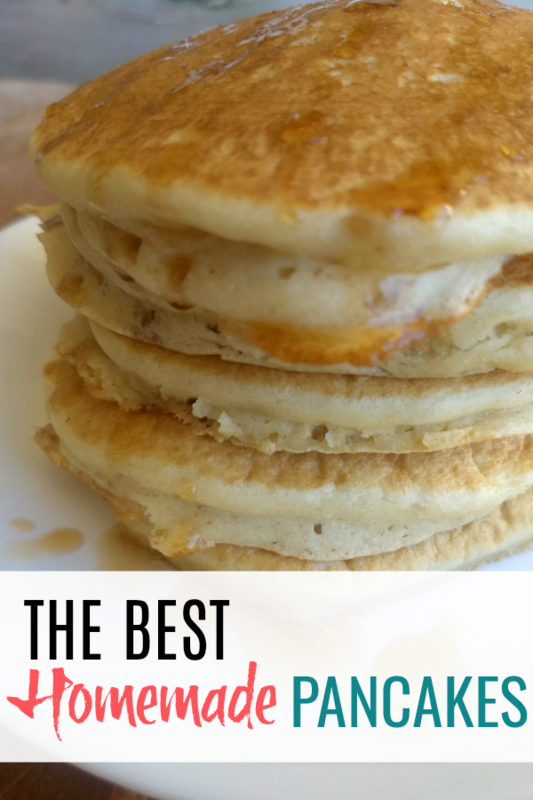 This is the best homemade fluffy pancakes recipe out there. This post uses affiliate links. See the disclosure page for more info. Many a Saturday morning growing up, my dad would pull out the big giant green Tupperware bowl and mix up a humongous batch of pancakes. We ate dozens of these things each week. I can remember him even feeding numerous neighbor kids. Now that I have kids of my own, pancakes or waffles are a typical Saturday lunch. 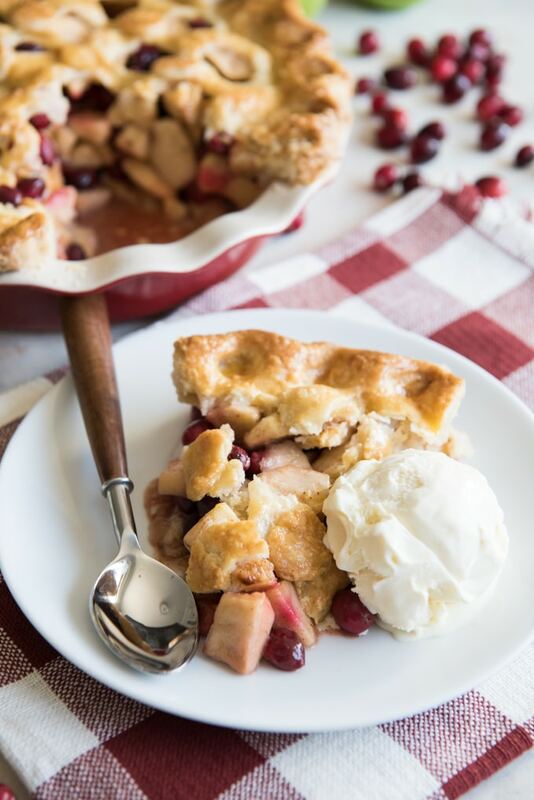 Maple syrup is our go to topping but fruit and/or butter would also be delicious. There are two things that help make these pancakes extra fluffy. Let’s start with the buttermilk. 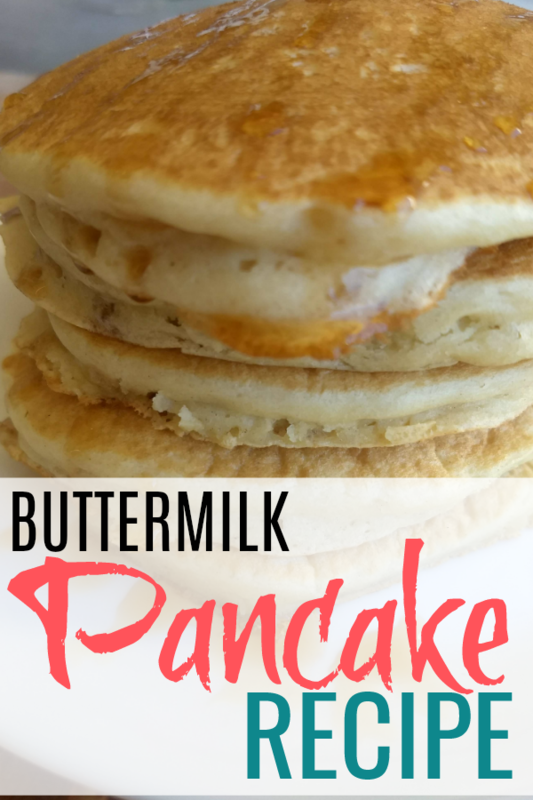 Buttermilk makes amazing pancakes (and rolls – I’ll have to share that recipe soon). If you don’t have buttermilk, you can do the trick of adding a little vinegar to the milk and letting it sit a few minutes. You can also use almond milk and vinegar for a dairy free substitute. This is the second secret. Separate your eggs and beat the egg whites until they are stiff. 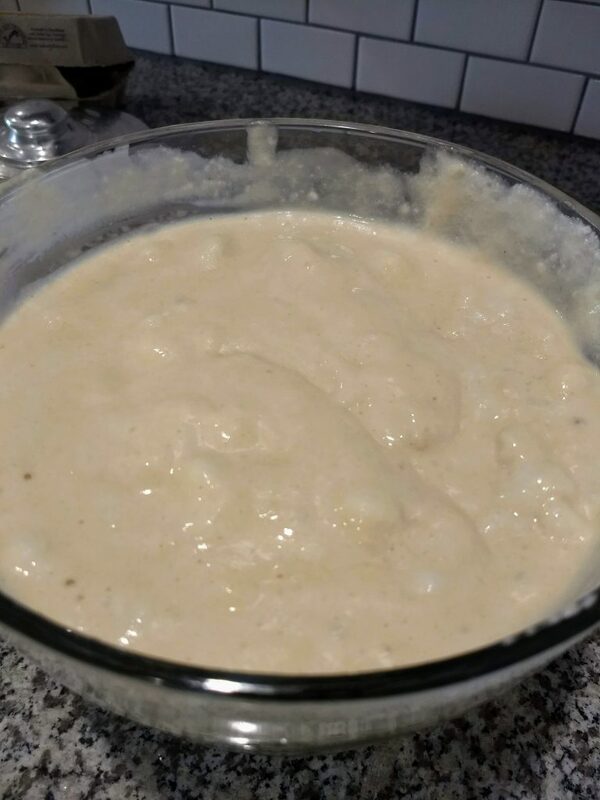 The final step before cooking your pancakes will be to fold the egg white mixture into your batter. I love using a silicone spatula for this. Mine are from The Pampered Chef, but these ones on Amazon seem to have good reviews too! You guys, this is so good! You might dirty an additional bowl but it’s worth it. 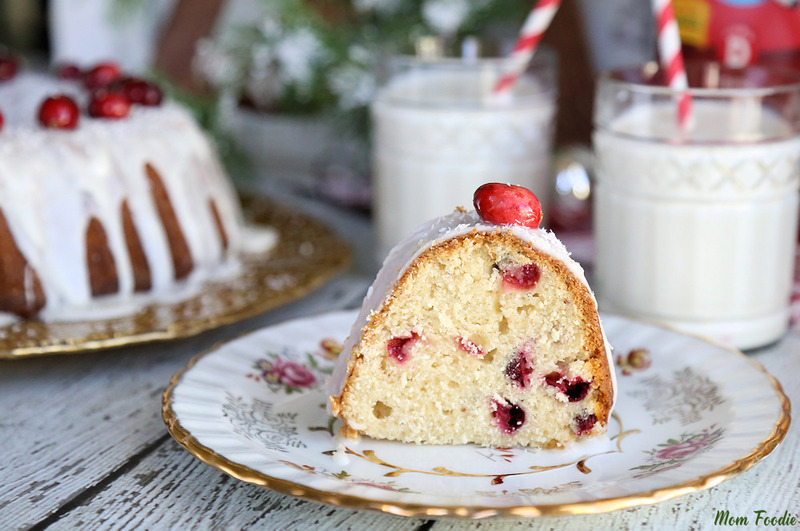 This recipe also calls for an optional extra – a little bit of cinnamon. Give it a try! In the pictures above, I made a triple batch. 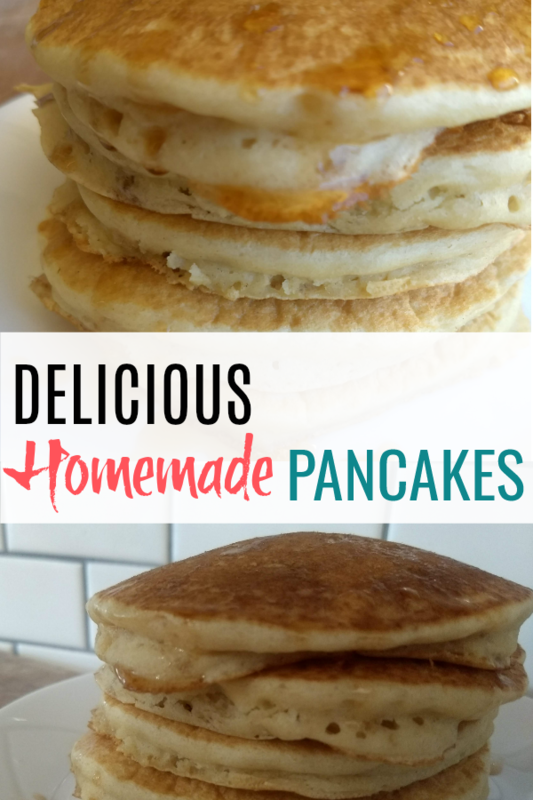 I love to whip up a giant batch of these homemade fluffy pancakes and put the leftovers in the freezer. Be sure and freeze them in a single layer and after the pancakes are frozen transfer them to a zipped freezer bag. To eat, pull one out of the freezer and put it in the toaster for the perfect, easy weekday breakfast. P.S. We even make these into whole wheat pancakes! Freshly ground soft white wheat is the best for that. Combine flour, sugar, baking powder, baking soda, salt, and optional dash of cinnamon in a mixing bowl. 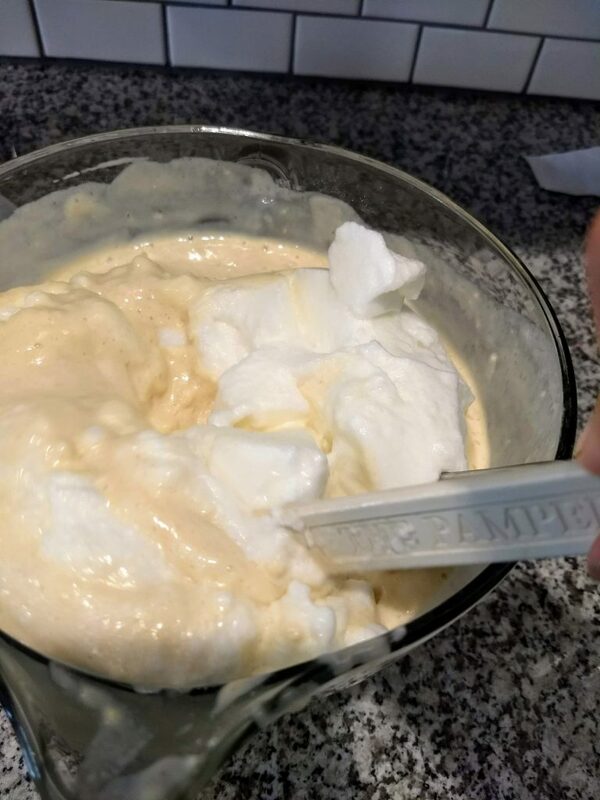 In a small bowl, combine the egg yolk, oil, vanilla, and milk. Pour over the dry ingredients and mix with a fork until lumps are gone. In another bowl beat the egg white until stiff. 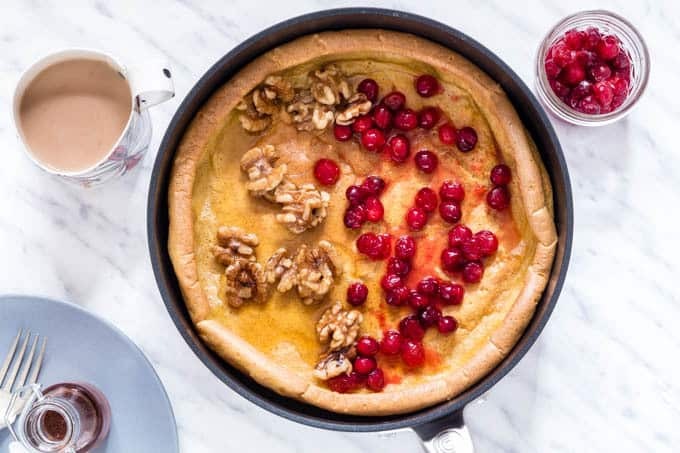 Gently fold the egg whites into the pancake batter with a silicone spatula. Put a ⅓ of a cup of batter onto a hot skillet and cook until golden. (Watch for small bubbles to come up and the edges to look a little more firm.) Flip and cook the other side. Serve with toppings of choice. 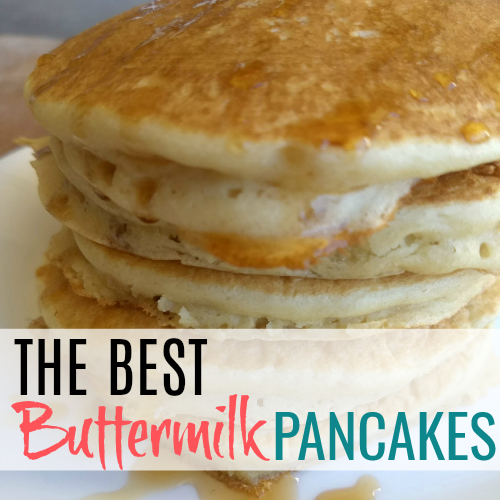 Buttermilk Substitute: use regular milk or almond milk, decreasing amount by 2 tablespoons. 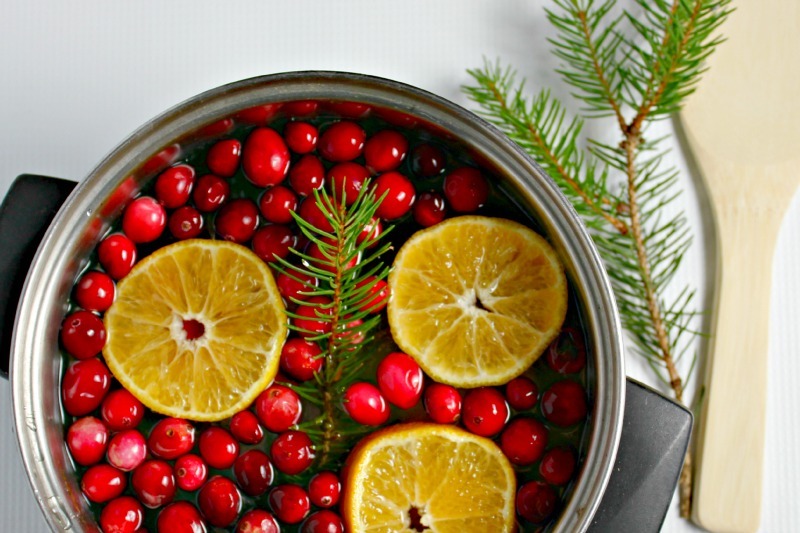 Add a scant tablespoon of vinegar or lemon juice and let stand for 5 minutes. This entry was posted in Food on September 24, 2018 by Deanna Michaels. 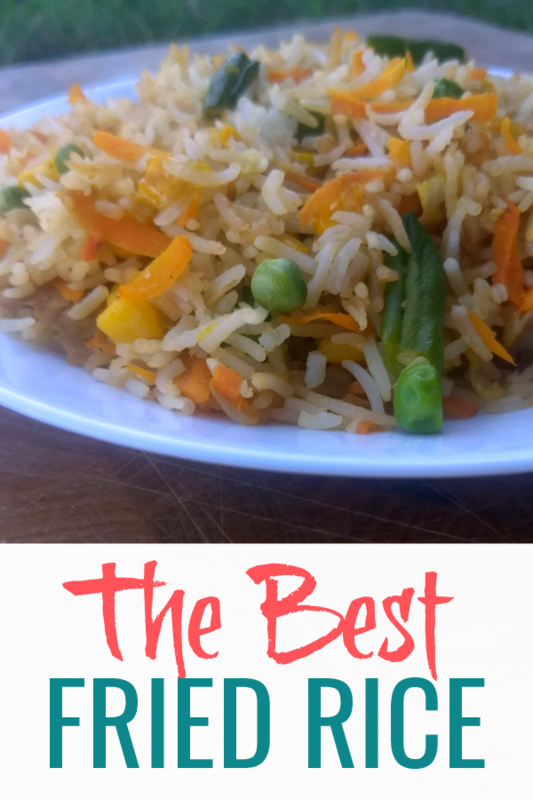 I love, love, love fried rice! 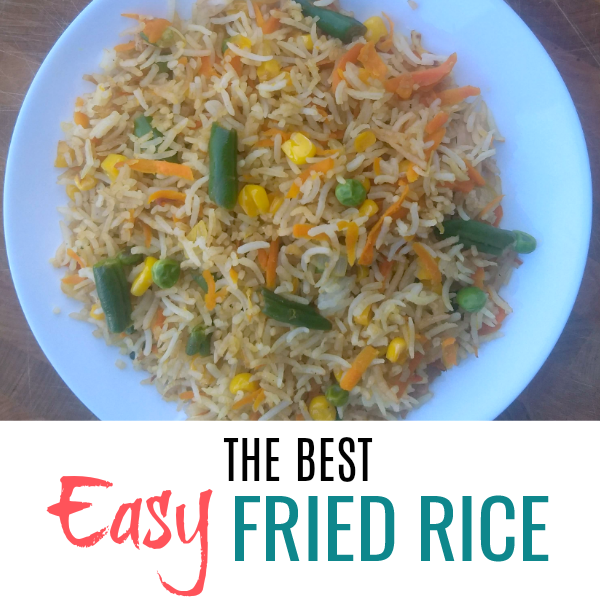 When you combine it with easy and get a simple fried rice recipe, it’s a winner all around! Affiliate links are used. Thank you! Secret ingredients are always a good sign! 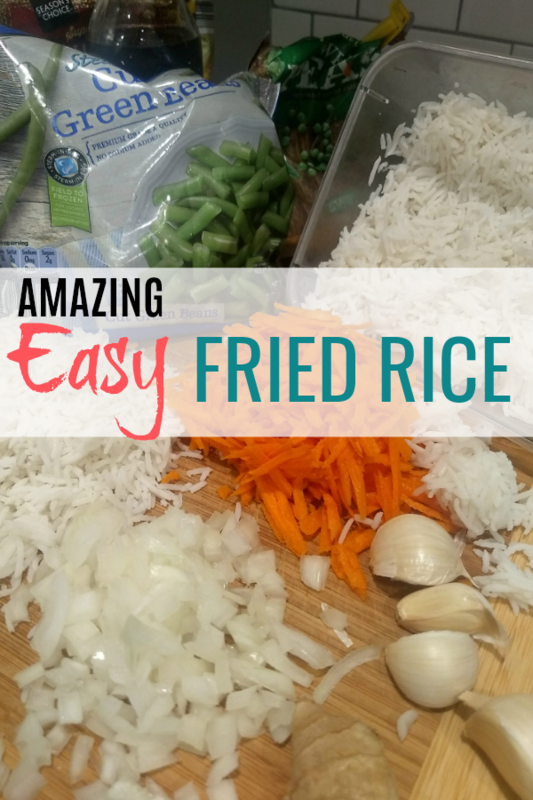 This recipe has a couple and the extra pop of flavor makes it the best fried rice. I love using basmati rice when making this. I’ve even used brown basmati. 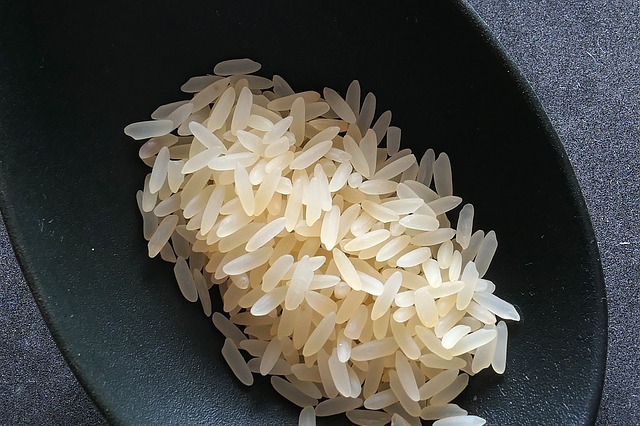 If you don’t have that, try using a long grain white rice. Try using cauliflower rice if you are limiting your carbs. Shredded cabbage you saute with the rest of the veggies would also likely work. If you don’t mind reheating in the microwave, this would also be perfect to freezer in single serving amounts to pack for work lunches. 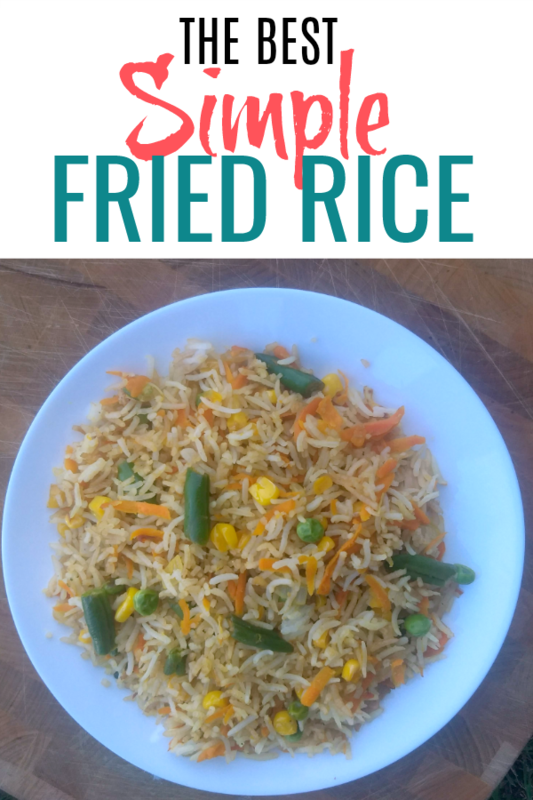 There are a couple ingredients that put this simple fried rice recipe over the top. Fresh ginger. Of course fresh garlic is involved, but the ginger adds a little something special. Sambal. Okay, this is totally optional. My kids don’t use it, but I’m obsessed. It adds a kick and a little extra punch of flavor. I blame my dad for turning me onto this years ago. You could also use siracha (I’ve also found the equivalent of this at Aldi). I LOVE using a microplane for the ginger and garlic. It makes it fast and super easy. P.S. I love using fried rice to sneak in lots of veggies. 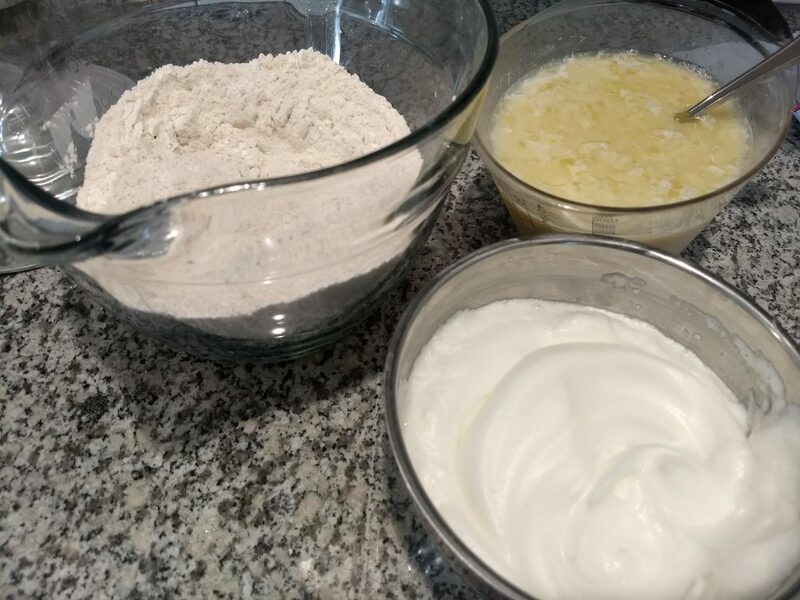 🙂 In these pictures, it’s the amounts listed in the recipe, but often times I add in extra. Heat a large pan over medium heat and add a little cooking oil (can use butter). After heated, add the onions and stir and cook 5 minutes. (Lower heat if needed.) When beginning to soften add garlic and ginger and continue to cook another 3-7 minutes until fragrant and tender. Add rice to the pan and stir over medium high heat for 3-5 minutes. Add soy sauce and and sesame oil and stir to combine. Take off heat and adjust soy sauce and salt and pepper if needed. Add scrambled eggs if using. Serve with sambal or siracha on the side. This entry was posted in Food, Main Dish, Recipes, Sides on August 31, 2018 by Deanna Michaels. We’ve been talking wheat free the past couple of weeks. 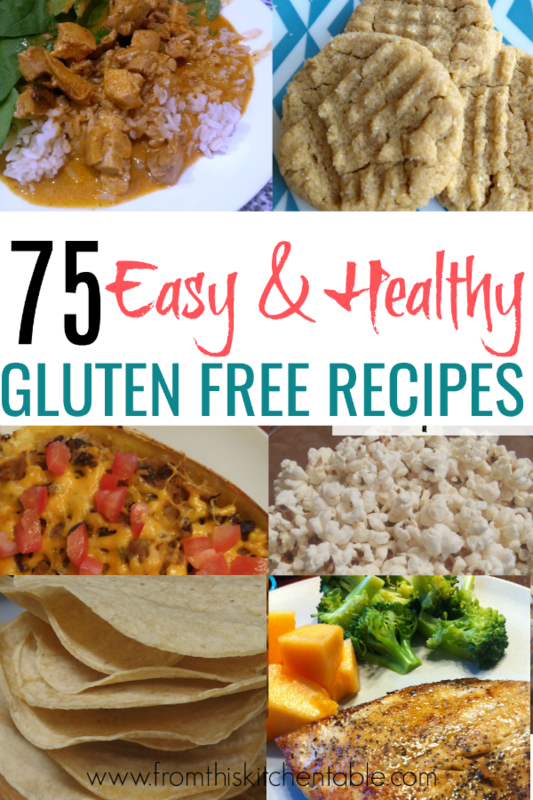 I shared about our wheat free experiment and gave 9 suggestion to make going gluten free easier for your family (and on a budget). One of the hardest things can be coming up with recipes. A comment I heard several times from friends was “I just don’t know what I would do if we had to go wheat free. I wouldn’t know what to eat”. 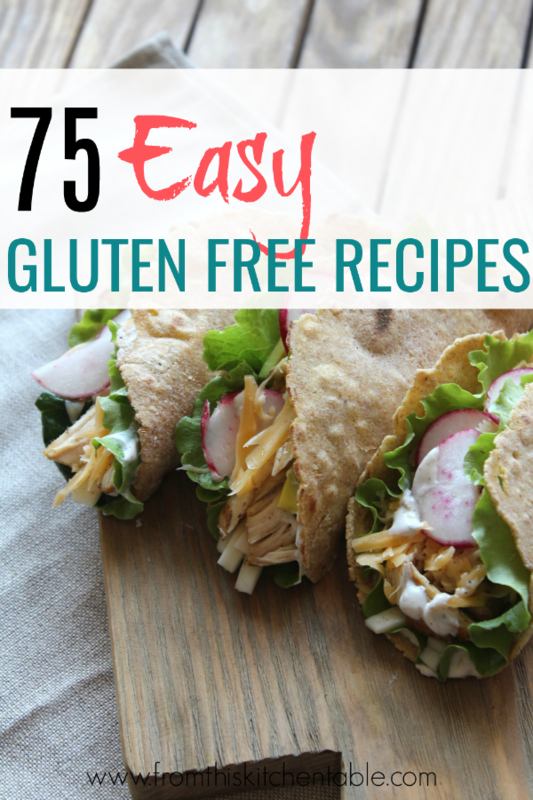 Today, I’ve compiled a list of easy gluten free meals to help make your menu planning a little easier. They are recipes that use ingredients you likely already have in your house or can easily purchase at your local store. 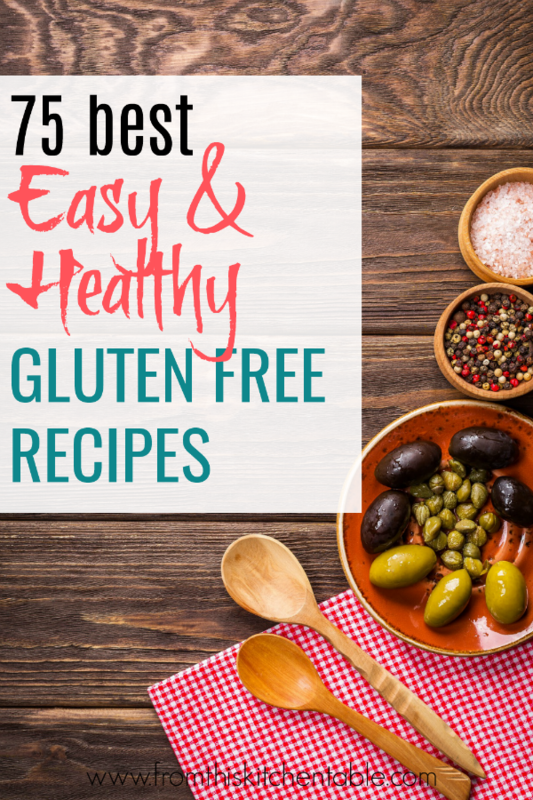 Hopefully you can find some great meal ideas whether or not you are wheat free and also see that there is an abundance of food you can still enjoy even if you are cutting out wheat. If you are new to gluten free eating, on the recipes that use soy sauce, be sure you read the labels because many contain wheat. 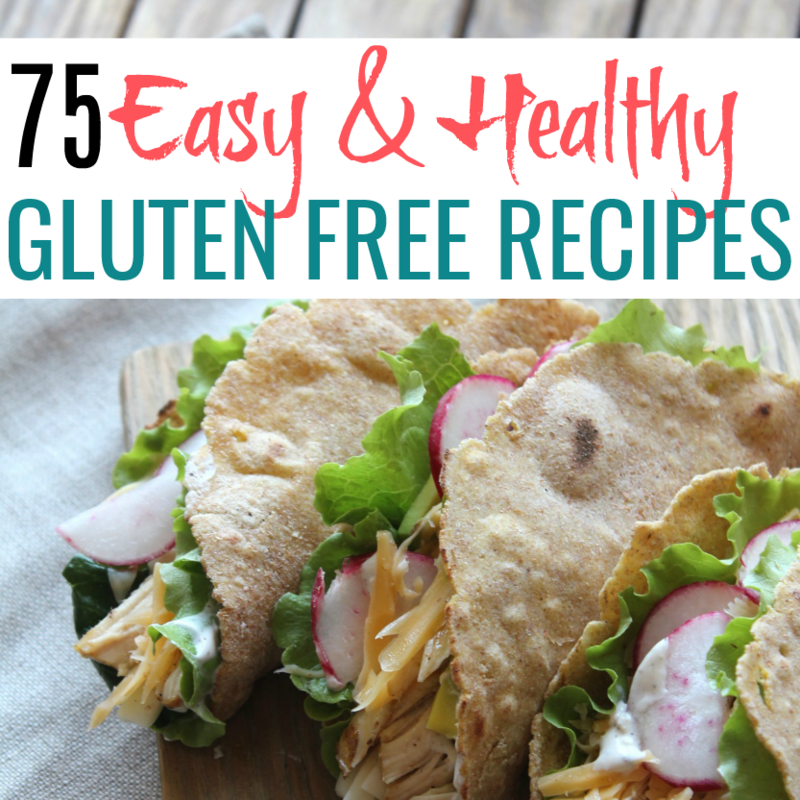 What are your favorite easy gluten free meals? I’m always looking for new, tasty recipes to try! This entry was posted in Food, Recipes on August 17, 2018 by Deanna Michaels. I use affiliate links in my posts. If you purchase through them I receive a small portion of sales. Check out my disclosure for more info. Salads are one of my favorite things to eat! In fact, I don’t think there can be too many salads in your repertoire. Who knew a plate full of fresh produce can yield so many different flavors? 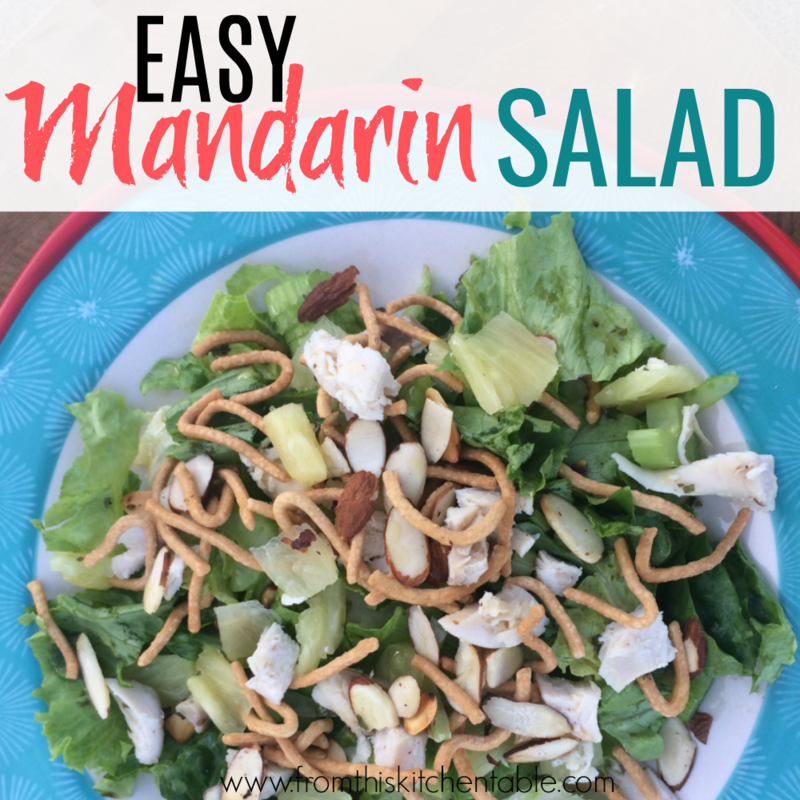 This Mandarin Salad is a fun one – crunchy chow mein noodles and juicy pineapple! Yum. I know we think of salads as health food, but salads can actually be full of not so great ingredients. 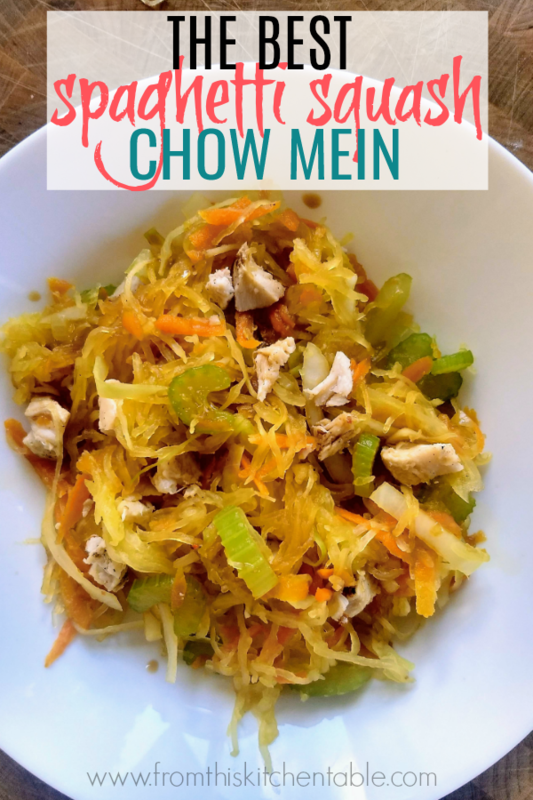 This salad is a bit of a splurge with an ingredient I don’t buy for anything else – chow mein noodles! But considering it’s just a topping – I’m okay with it. 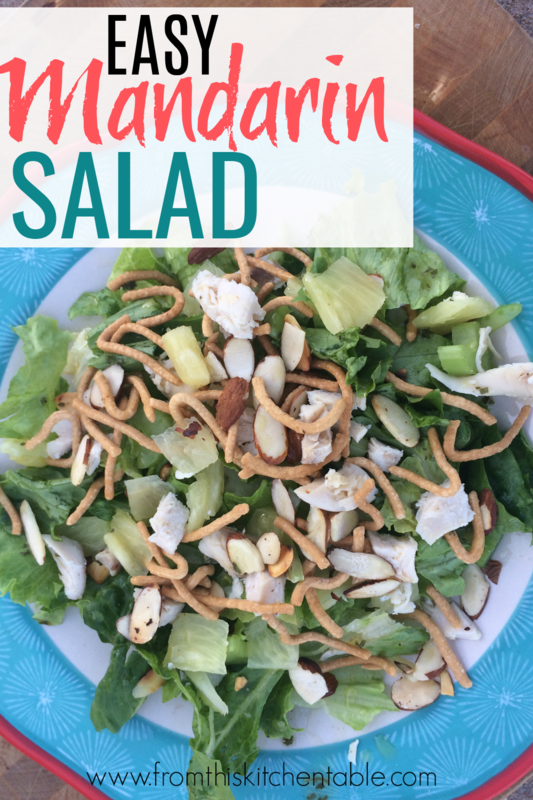 Besides, this salad is a fun twist on the typical salad flavors and is one of my husband’s favorites. These are the noodles they have available at our Wal-Mart. Maybe a health food store would have something a little better. 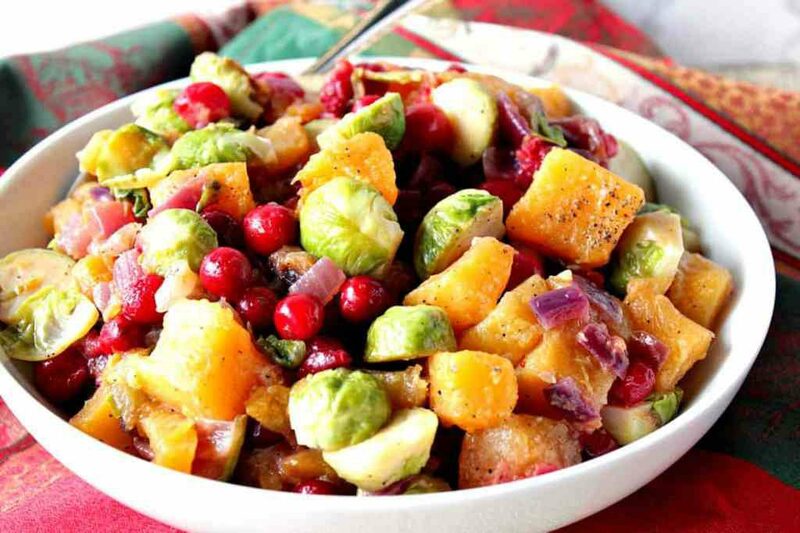 This is a delicious and unique salad you'll want to add to your meal rotation. Wash and tear lettuce into small pieces. 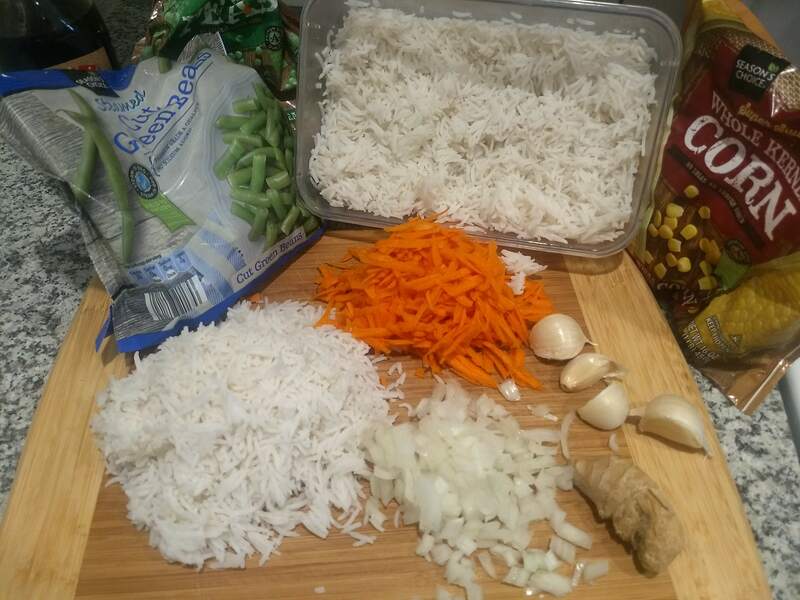 Place salad ingredients into separate dishes for a build your own salad meal (our preferred method) or toss together all salad ingredients except for the almonds and chow mein noodles. Top with chow mein noodles, dressing, and almonds right before serving. 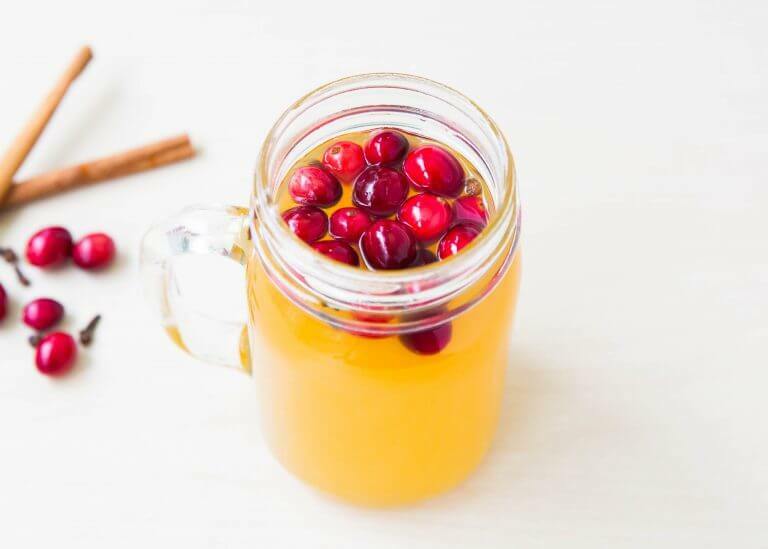 Combine all ingredients in a small mason jar. Shake well and refrigerate until serving. This entry was posted in Food on October 20, 2017 by Deanna Michaels. I associate memories or people with a lot of foods. 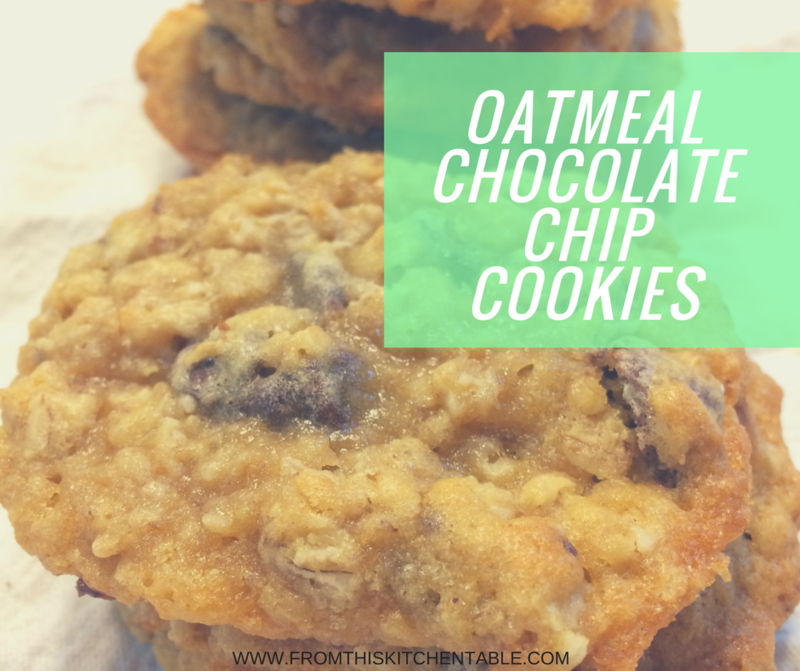 These Oatmeal Chocolate Chip Cookies are one of the recipes that we made when I was growing up that my mom got from her mom. Oatmeal chocolate chip cookies, sugar cookies, and molasses cookies are always the first recipes I associate with my grandma and they are all delicious. 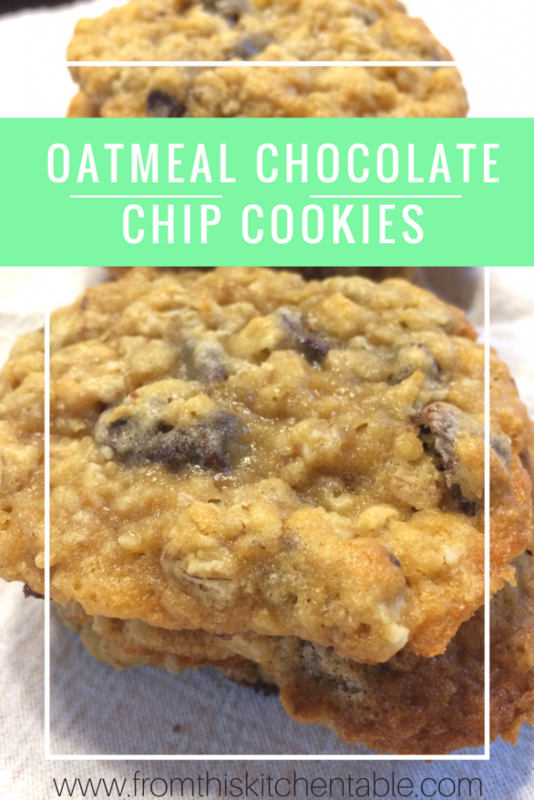 When I made these this last time my husband commented, “You know, normally I think oatmeal ruins a chocolate chip cookie but these are actually really good.” If you know Shaun’s love of a good chocolate chip cookies, that’s saying something. Besides, I really don’t think you can have too many cookies in your repertoire. Add eggs, water, and vanilla. Mix well. Combine 1½ cups flour, baking soda, and salt. Add to the butter mixture and mix well. Add oatmeal and combine. Add up to an extra ¼ cup of flour depending on your dough consistency. Bake at 375 degrees for 8 minutes. Makes 2 - 2/12 dozen cookies. This entry was posted in Desserts, Food, Recipes on June 30, 2017 by Deanna Michaels.